Help! My Worship Team Member Always Shows Up Unprepared! 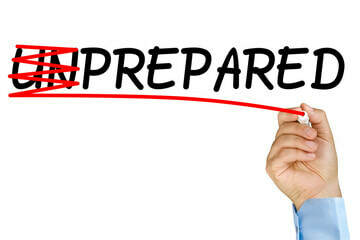 So What About When A Team Member Shows Up Unprepared? Just curious, what do you guys do when you have a musician show up unprepared and not knowing their parts? How do you handle it or address it? Also, how do you handle a musician trying out and not quite being up to par? Two different issues, and for the first question, the answer is: it depends. In a newer ministry team, or in one going through transition (for example, let’s say you’re the new worship leader at the church, and you haven’t quite brought the team up to the standard of proficiency that you’d like to them to be at) then the rule of thumb is let grace abound. Bring people along as quickly as they are able to follow your lead. In an established ministry team where the expectation has clearly been expressed and the standard long held that members will arrive prepared, it’s easy to hold the standard. And you should. Similar to when a team member shows up late, for a one time only occurrence, let grace abound and love cover over a multitude of sins. Life happens. We have to make room for that. Sometimes it’s just been that kind of week, and we have to make due the best we can with where we’re at in our real lives, not our fantasy artist lives where everybody always shows up 100% prepared. Routinely remind the team that their participation matters to others, and ask them to communicate to you (or the worship leader that is leading that week if it's not ourselves) as quickly as possible if they’re ill prepared. In fact, at the beginning of our time together, we can ask the whole team about each song, where they are in terms of preparedness, using Worship Team Coach’s Preparation Scale. In that 1-5 scale system, 1 means you don’t know the song at all. 2 means you can fright read it, but you’re still really learning your parts or even the basic roadmap. 3 means you know how the song is supposed to go, and you may know your parts, but you’re still dependent on the charts to play it – it’s not yet committed to memory. 4 means you’re pretty solid on it, but you might occasionally need a cheat sheet to keep on track. 5 is mastery of the song – you have taken it off the page and put it in your heart, you know it so well that you can focus on worshiping the Lord and engaging with the team, and the only reason you’d make a mistake is that you’re human and you occasionally make mistakes. Our expectation, clearly and routinely expressed to the team, is that team members will show up at least at a 3 with each song. The ideal is that we build to being a strong 4 on all songs, and eventually a 5 as we grow together as a team. Some songs we’re already at a 5 with... you can probably figure that for many musicians, simple songs like “How Great Is Our God” or “Blessed Be Your Name” might be a strong 5 right from the get go. Other songs take time to build proficiency. Set the expectation clearly and repeat it often to set the culture. Yes, that’s hard. Yet... It shows love to them, because we want to set them up for success, not embarrassment; it shows love to the rest of the team by not letting them get taken off course by a team member that isn’t able to contribute helpfully, and it shows love to the church by protecting them from getting distracted in worship by shoddy musicianship. It also shows love to the Lord, who himself tells us that he values excellence – our first fruits, the best offerings. Not the blemished, sick, or weak lambs. Not our leftovers. The best. Point toward the biblical standard for worship ministry (2 Chronicles 25:7 – all the musicians were trained and skilled in music for the Lord) and give them specific objective observations on where they need to develop in order to be able to meet that criteria. Be as specific as possible with those criteria of where they are falling short, and if possible record them playing with the team during the process of having them engage as a potential team member, so you can meet with them privately and play that recording for them. When they are able to hear how what they’re doing isn’t gelling with the rest of the team, and they are able to make that observation verbally themselves, then we’re in a good place to have a conversation together about how to help them grow in that area (or those areas). We need to provide them a specific framework & description of what that role must be able to do, with different achievable levels of proficiency. And we should do our best to try to get them plugged in with resources to help them develop. Challenge them to make the investment of time and resources to grow in that gifting, if that’s where they really feel called to serve. Some folks are able to grow quickly through individual instruction and within a few months they’re ready to give it a go, at a level that works to serve the team and the church. Some folks take longer, and need sustained encouragement to keep at it.